In my recent book, I made a big point about flat Earth theory being the jewel of modern physics, and how flat Earth theory has been presented as the most important political contribution which science has ever made for modern man via climate alarmism. You will note, with half a brain, that those figures represent the Earth as flat and with 342.5 W/m² as the solar input (which after other factors applied comes out to -18°C as heating potential). Perhaps a less-technical looking diagram would help simplify things for you? Modern physics. This is modern physics. This is what modern physics thinks of the Earth and the Sun. The above diagram is modern physics. 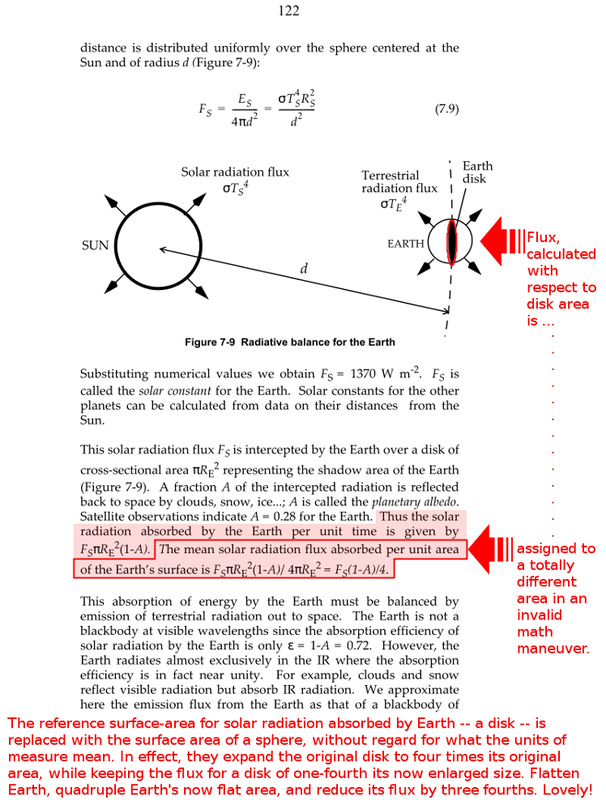 The above diagram is quite explicitly what modern physics thinks of the Earth and the Sun via its climate alarmism. The above diagram is what myriad scientists are publishing scientific and physics papers about in professional academic journals, what they’re getting paid to teach children, what they’re getting paid to research, and what they’re presenting as a basis for the most important political action which they have ever recommended to society. The above diagram is the basis of the three before it, the basis of climate physics and climate alarm as taught the most expensive Ivy League universities in the world. 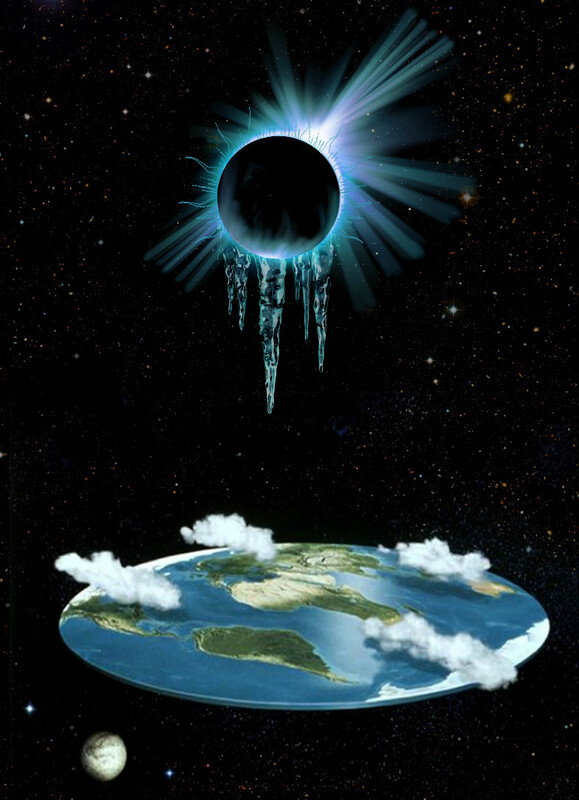 Since I cannot resist philosophical and logical paradoxes, I must ask you: What is the distance of climate alarmism’s and modern physics’ flat Earth away from the Sun? The Earth of the above 4 figures..what is its distance from the Sun? 298272585139 / 1.496×1011 = 2 times distant from the Sun than the Earth is. And so in modern physics, the distance that the Earth is from the Sun is twice the distance of the Earth from the Sun. 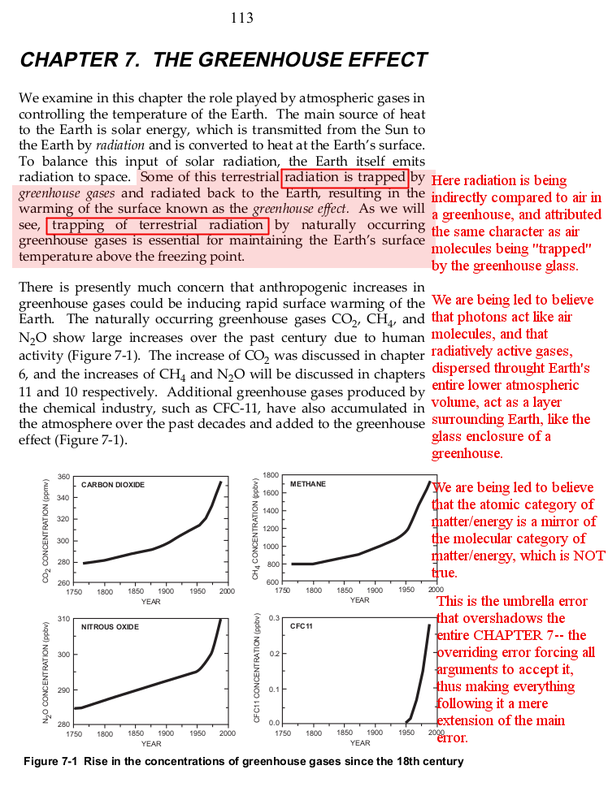 The other major portion of my book was in explaining how it is possible for science to make a mistake like this. The truth is that science can make a mistake like this because science is chalk full of really stupid, incoherent, meaningless, and actually un-understandable mistakes that it actually holds as its basis and its most celebrated theories! That’s the truth of science. Scientists couldn’t recognize a mistake or an incoherent idea if the Earth was presented as flat to their face… Oh, wait!! Modern physics and modern scientists are actually predicated upon believing in incoherent and meaningless ideas which are obvious mistakes. To be a modern scientist, you must reject the use of reason and instead accept the sensation of cognitive dissonance as the standard for truth and that which must not be questioned. The cognitive dissonance of the modern science practitioner is thus actually a form of faith, because they actively choose the cognitively dissonant as the standard for truth and as that which must not be questioned! Scientists think that the peer-review system and process will weed out mistakes….and yet, flat Earth as its most important political contribution to modern man is fully peer-reviewed and accepted science. And the other incoherent bases of modern science are likewise peer-reviewed. And so that’s how science can make this mistake. It can make this mistake with consummate ease. This is precisely the type of mistake one would expect science to make once one understands the cognitively dissonant psychological requirement of being a modern scientist. It’s time for a new science, for a rationalist science which is actually informed by the intellectual tradition and which rationally solves seemingly incoherent problems instead of accepting that plainly irrational, illogical, and paradoxical things form the basis of existence. Maybe that would have been a better cover page Robert! Well, yes, that image was in the running, but I guess I never pushed it, partly because the sun part of the icy sun had those primitive lines from my very first rough attempt. But now it seems appropriate, since those primitive, childlike lines mixed in with the ice drips, fit an undeveloped mind better. It’s like radiating “heat waves” confusingly mixed with icicles, hanging over a cartoon flat Earth. Of course, if the sun were to scale, it would probably be invisible, so, on a cosmic scale, “greenhouse” folks have a practically invisible star, at the distance it would have to be to do the “greenhouse” thing, HEATING the flat Earth. Since you do not like the use of “average insolation” to create a simplified description of earth’s heat flow because the behavior of the system is not linear (in particular, T^4 emissions), how do you accommodate the use of ideal gas law formulae to compute the expected surface temperature due to pressure, given that the behavior of any given packet of air in any air column is not thermally isolated from its surroundings, and is not measured by moving that packet from surface to stratosphere, nor vice versa? After all, averages and ideals are just that: not real models of reality. There are valid averages and there are invalid averages. There are averages that physically correspond with reality and in-situ measurements of reality, and averages that have no meaning. Average insolation is the latter – it is not measurable and it not a measured value, and has no meaning, and cannot replicate in-situ physical responses and behaviours of the system. Flat Earth with average insolation is not a simplified description of Earth and its heat flow: it is invalid, full stop. The average in-situ and real-time influence of a large number of particles does result in the measurable quantities of pressure, temperature, etc. The averages embedded in the ideal gas laws are real-time, in-situ quantities that can actually be measured, and have real-time influence. Average insolation is no such thing. Flat Earth is no such thing. The averages in the ideal gas law are about the net effects which a very large number of particles have in real-time and which have real-time influences. This is entirely different than average insolation which embeds a flat Earth requirement in its creation, and which is not measurable and is not about real-time influences. You really didn’t intuitively grock all that, and needed it to be explained? Average visitors per day has real meaning and real application. Average cost of stock in a given day does not. All averages are NOT meaningful. This is where intelligence comes into play, … to judge intelligently when an average has real meaning. It’s a minor point, I guess, but could someone please explain to me how that second highlighted passage has any clear grounding at all. What the hell is “mean position” — mean position of which particle or particles (the whole ensemble?? ), … around what position of what particle?, ensemble center?? … and which university is this again? It just looks like razzle-dazzle lingo to make readers (students–God help them!) think the teachers are competent, ’cause they use biG wuhrds. They just mean, say, like a box containing gas, and the gas of course moves all around and over time their mean position is that of the center of the box. But yah…kind of a stupid thing to have to say. Kind of really stupid. Just to dwell on the point: What I see is an object, recognized as a defined entity, then reduced to its particles, now wanting a mean position of its particles. But where’s the reference point now to determine the mean position, if its particles ARE the now moving conceptions and not the solid? I see a solid/particle confusion that is not resolvable in a description that confuses the two. Which comes first, the object or its particles? Which conception do you then use to locate its center, around whose mean the particles move? — move how? – not as a unified mass vibrating all at once the same way, right? — so how? What is moving? — each particle? — with respect to what? — all the particles? — with respect to what common location? — moving orbitally?, … radially? … randomly? I cannot find any traction in those words. Since we disagree, somebody needs explaining, surely. The only way the ideal gas laws apply is when a packet is transported from one pressure level to another… without any energy transfer in or out of the packet. There is no such condition when two different packets are involved. Certainly this is obvious from the fact that inversion layers exist, and hotter zones in the stratosphere occur. In particular, we can measure P, and T, but what’s V, since there are no container walls? 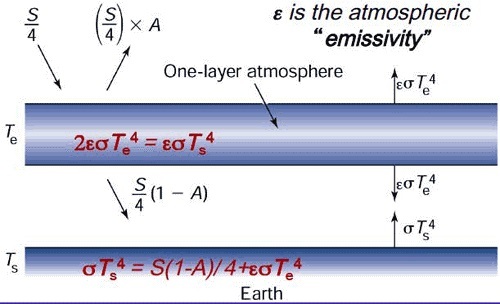 I become quite concerned when the chief argument from some people is the application of the gas laws to explain temperature differences, when it is absolutely measurable that such stratification does not exist on the planet, and certainly there is constant and variable energy transfer from/to any designated packet to/from those around it. If this does not trouble you, why not? Is it not just as bad — reducing the atmosphere to a simplistic application of the gas law, ignoring the environmental deviations from them that are observed — as reducing the climate description to an average of absorptions and emissions projected? Wait a moment. So now my comment is worthy of “moderation”, because I question the dogma? No, but because your comments don’t make much sense. There IS a temperature gradient in the atmosphere. It IS explained by an application of ideal gas laws via differentials. Joe: the problem is that the temperature does not smoothly correlate with pressure. There are inversions, and other temperature events due to such things as condensation. It’s not as simple as some sort of perfect match-up with pressure and temperature. Using the gas laws to predict surface temperature is an oversimplification, based upon an improper model of the atmosphere, not least of which is the fact that the atmosphere is not composed of “ideal gas”. In that sense, it’s no different than the oversimplification done by the warmists: there is no simple model. 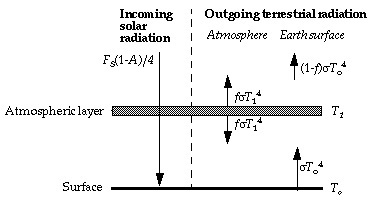 The temperature from surface through the Thermosphere goes up and down a lot, because of the serious intervention from cosmic rays and solar wind. Even in the Troposphere, there are irregularities. It seems disingenuous to me to reject the bogus warmist oversimplification, but then embrace the oversimplification of declaring that all is explained by the ideal gas law prediction, when it simply doesn’t work except in the lowest altitudes while ignoring cloud formation and frequent temperature inversions. I think that your examples are the exception which prove the rule. Inversion layers and other such things have physical explanations and known mechanisms which result in the differences from Ideal theory. I agree that the system is complex, and chaotic. The concern is the troposphere though, where the “greenhouse effect” is said to operate, and where the ideal laws would apply. Outside of this region, the total energy content becomes negligible even though the temperature and other things become non-ideal and wild. It certainly is possible to reject certain degrees of oversimplification…for example when the oversimplification goes all the way to flat Earth theory. Other oversimplifications are not so bad, and can inform of general principles even though there are explainable exceptions to the general principles. There is no validity whatsoever or general principles, though, in flat Earth theory full of paradoxes. It is good that we agree that the system is complex, and chaotic. Unfortunate that we cannot agree that translation of a highly constrained teaching aid like the ideal gas laws, with constant number of molecules and deliberate isolation from other sources and sinks for energy, somehow can deftly and simply explain surface temperatures. I’ll leave it with this parting comment: even ignoring the constant presence of counter-examples to the application of the gas laws inside the troposphere — the fact that the atmosphere is by no means an “ideal gas” in behavior, and no pair of “packets” (identical in composition and mass) from anywhere in the atmosphere would be expected to match in P, V, and T agreement because of those non-“ideal” factors — it definitely strikes me that ignoring the behavior of 20% of the atmosphere above the troposphere is a glaring oversimplification, particularly since every last joule of energy incident upon, and departing from, the earth passes through it, and materially affects it. Just as it’s no good for the warmists to contrive an explanation that’s all about CO2, it’s just no good to take a chunk of the atmosphere, assign an “average” behavior to it, ignore all the deviations and call the explanation satisfactory. Since it appears we will get nowhere with this, you have the last word, if you like. Well, of course you will, since it’s your blog, after all. It seems disingenuous to me to reject the bogus warmist oversimplification, but then embrace the oversimplification of declaring that all is explained by the ideal gas law prediction, when it simply doesn’t work except in the lowest altitudes while ignoring cloud formation and frequent temperature inversions. There’s oversimplification, and then there’s claimed simplification that really is a false claim disguising absurdity. The bogus warmist variety is the latter. The gas-law prediction, thus, might be, at least, a step up from that. As I pointed out, your exceptions to the rule, in this case, prove the rule, because they are explainable as exceptions to the rule via known mechanisms which cause deviation from the (ideal) rule. I agree that there is a lot going on, and I wish for actual climate science to do science with it. 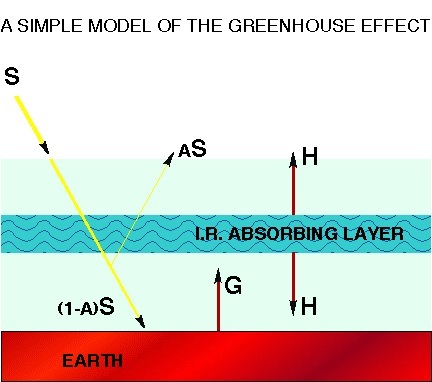 For anyone to do that, they need to realize that this alternative greenhouse effect idea of theirs is bunk. 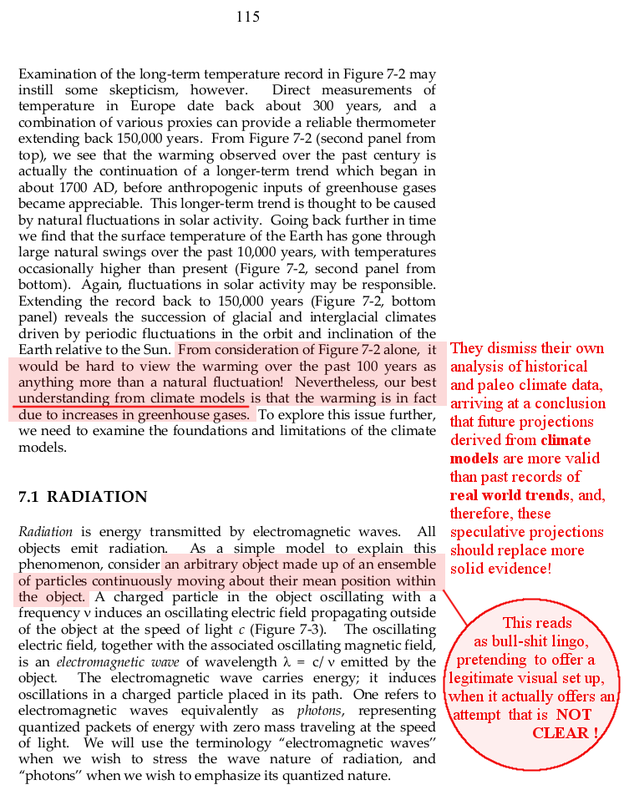 Mean solar radiation … is a fiction. Yes, good. The disk cross-section for the total intercept of light is fine, and obvious, but then yes, you point out that it is actually then spread over the entire surface of the Earth at once! Sure, that’s a mathematical mean…but it is not PHYSICAL, not what’s actually happening, not what is actually driving the system, not how the physics of reality is actually playing out in cause & effect in real time. That mathematical average, while can be done on paper, is not physically meaningful. And you simply need to point out that that average makes sunshine -18C, and so, meaningless because we know that sunshine can melt ice, etc. Yes, the disk-cross-section-total-intercept for the half sphere is provable mathematically, via calculus (an integration of some sort, I think). But the f**k up comes at proposing to dilute this correctly-derived quantity, by spreading it over the whole spherical area at once. What rule would allow this? — there is no equivalent calculus maneuver to un-integrate it and then divide it to make any meaningful dimensional continuity in the operation. The compression from half sphere to disk is a correct numerical treatment for physical reality. The expansion from disk to sphere is an incorrect numerical treatment for physical reality. There’s nothing in reality that such a mathematical maneuver represents. Good article. I would add not only is the Earth round-ish, the surface is not uniform. On land you have changes in elevation and surface composition to consider. And of course the surface area of the oceans are in a continuous state of flux due to several factors. In other words, I would expect a desert would generate more heat than an equal area of marsh land. And as I understand it, daily temperature swings in a desert can be quite large. Also, how does the specific heat of water affect this calculation? Beyond the ability to absorb IR, doesn’t water act to both to limit heating in the day and retard cooling at night? And of course water transfers energy to the atmosphere in the evaporative process, releasing that energy when it goes from vapor to liquid in large part I assume because of the pressure gradient. It doesn’t appear evaporative cooling is part of the model. Areas with higher water content are generally lower in temperature than areas at equal latitude but which are dry. While water content does indeed lessen the swing in temperature, i.e. in comparing a humid area to a dry area, the temperature of the humid area is on average less than the dry area. The dry area gets much warmer, and while it cools drastically, the cooling is not enough to offset the high and so the average is higher for a dry area as compared to a wet area. Ice-ages are of course quite wet, i.e., the land becomes saturated with water, etc., thus cooler land on average, allowing the formation of low-latitude snow pack, etc.